Learning how to use reverb is essential in mixing. It can add width and distance between you instruments. Reverb can also make your tracks sound like they were recorded in a completely different space. This is particularly helpful if you are recording in a bedroom or small home studio environment and you want your tracks to have that big studio sound! The biggest mistake that you can make with reverb is going overboard and making a washy muddy sound mix where everything is smeared together in reverb. 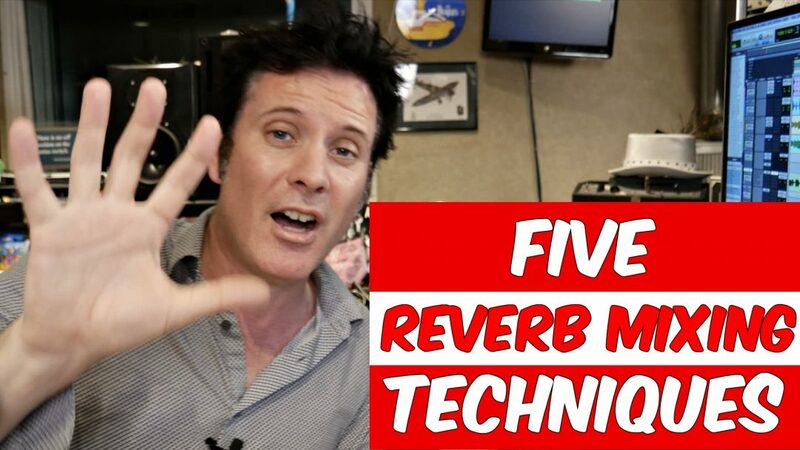 If you find yourself struggling to use reverb effectively, here are 5 tips to get you going. EQ your reverb. – Insert an EQ plugin after your reverb and simply roll of a little of the high end and the low end. In the video below you can see me do this on the kick drum and it keeps the low end from sounding muddy, while adding a little space for the drum. Pan Your reverbs – If you want to add width to you mix then use a mono reverb and pan it opposite of the instrument that you are applying it to. This is a great trick for being able to make a left and right guitar part sound wider. Pan the left guitars reverb to the right, and the right guitar’s reverb to the left. Trigger your Snare reverb from the sample – This is a great trick for making your snare reverb sound more consistent from hit to hit and sound cleaner. When you trigger the snare reverb from a sample you don’t have to worry about adding unwanted reverb to the hi-hat or other instruments that were also picked up by you snare mic. You can even use this tick to trigger the reverb, and keep the snare sample muted and out of your mixing, by sending the sample to the reverb send pre-fader and muting the sample. This is great if you want to use you live snare drum, and not blend a sample in to the final mix! Compress your reverb – This is a great trick to keep your reverb from sounding too washy while the singer is singing. Insert a compressor after your reverb, and use the vocal in the side chain of the compressor. When the singer is singing the compressor will turn the reverb down for you, and when the vocalist stops, the compressor will let the reverb come up slowly. Adjusting the release time will determine how quickly the reverb swells in after the vocalist finishes a line. Check out the video below to see me demonstrate all of these tricks. If you have any comments or questions be sure to leave them below!